I am a crafter… there … the truth is out! I have done some sort of ‘making of things’ all my life. Most of it I taught myself, as my family does not have any crafty types in it. But my mom is so amazing that she bought me whatever I wanted in the way of craft supplies. So I was able to try a lot of things. This is my embroidery book. I used it to teach myself all kinds of amazing stitches and I’m so happy to still have it. This is my childhood embroidery basket. Being a child of the late 60s and early 70s a bold PLASTIC basket was the in thing to have… it’s sure durable! In the world of quilting we don’t work just with fabrics cut and pieced together… oh no… we love to ADD to that fabric with amazing embroidery! There are many types of embroidery. Today I’m touching on three areas and have two guests sharing about their particular embroidery passion. First up is a Q & A with Bari J. of Bari J. Designs. I thought she was perfect to give us some insider tips! She has videos on her “WLFK” blog as well.. so you’ll want to cruise over there. 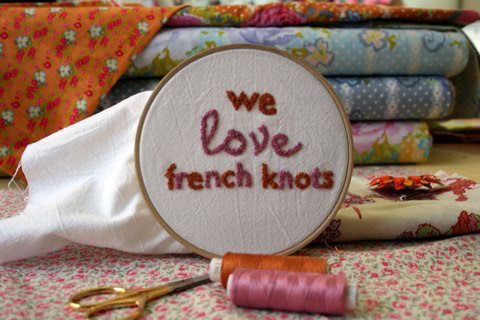 What are the common thread weights you like to do embroidery with? What size needles do you use? I use a size ten for most of my work. However, if you are going to use perl cotton you’ll need a needle with a bigger eye. What fabrics do you like for the base of your design? Do you back the fabric with a interfacing or a batting? I use a lot of plain old quilt weight cotton. I do put interfacing on the back of the fabric. I use form flex which is a light weight woven cotton fusible. What is your favorite way to transfer designs? I love the product, transfer-eze. You print your design out, it sticks to the top of your work, you stitch right through and then dissolves in water when you are finished. I also like to use a light box and frixion pens. When is it important to hoop your work? For many stitches, using a hoop is nearly imperative in my opinion. This is so that your stitches are nice and tight (not too tight) and not loopy and bumpy. However, there are stitches that are best done without the use of a hoop like the bullion stitch. When you’re done, what are the ways you like to use the embroidery? 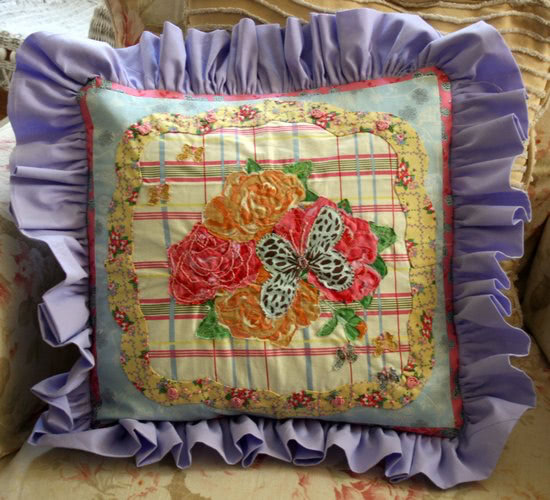 I like embroidery on pillows and in quilts and I especially like to use it on a smaller item such as a bag. The work is so small and intricate I think it makes a great impact on small projects. Visit Bari J. at Bari J. Designs. 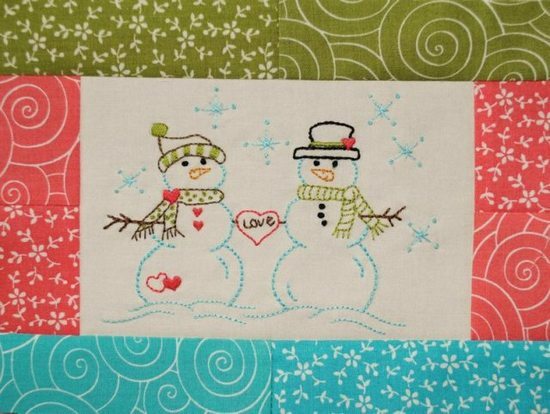 Here at the Quilting Gallery we have a great series of posts by Lenna Green. 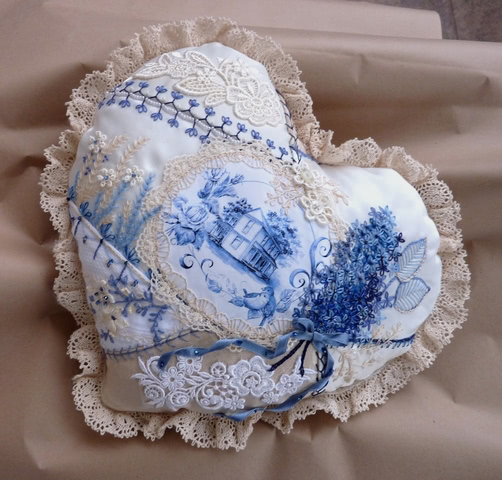 She wrote and video taped an entire series on embroidery … check out her posts. This year I’m the host for Aurifil’s Designer of the Month mystery blocks. And the featured style is embroidery!! Bari J. is one of our upcoming designers. And we already have four fabulous FREE blocks for you to download and print! Find all the interviews and download the patterns here. Plus read how you can get in on a chance to win Aurifil thread! When we first announced our Learning Center topics we received a lovely note from Connie Eyberg about crazy quilting. 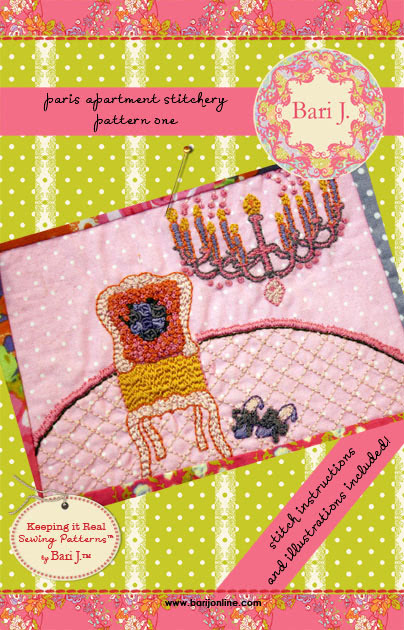 Since Crazy Quilting is Connie’s passion I asked her to guest post about it today! 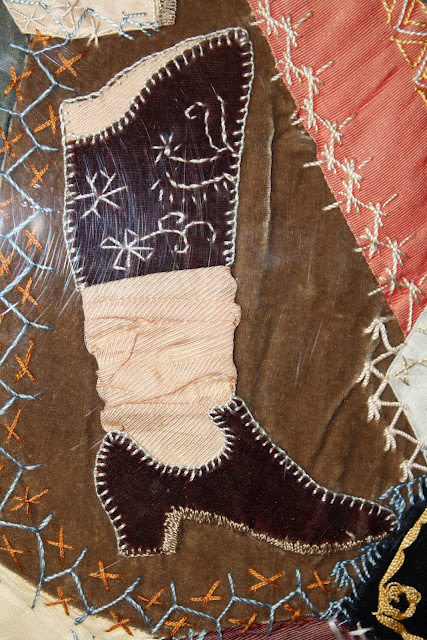 Crazy Quilting is one of America’s earliest quilt styles. It gained popularity in the 1800s through the early 1900s (roughly 1876-1910) and is a style of quilting associated with the Victorian quilts. 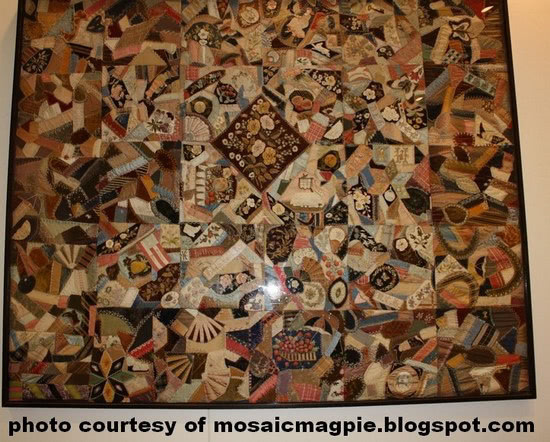 It is easy to identify a crazy quilt by the use of irregular shaped patches in various sizes joined together in a random manner with no pattern in particular; it is then embellished with decorative stitching. The seams were embroidered with intricate stitches and some areas on the quilts were then adorned with fine stitchery and sometimes painted designs. 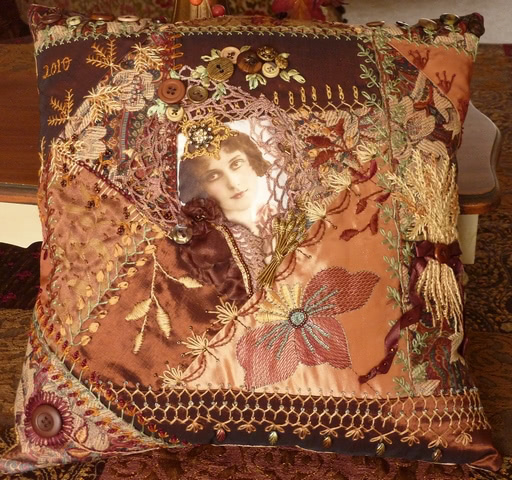 Originally stitched by wealthy women using fancy fabrics such as silks, velvets or brocades, women of lower income were soon creating their own crazy quilts through the use of castoff clothing of wealthier relatives, scraps sold by factories at reasonable prices, etc. Denim, flannels, cottons and other more common fabrics were also eventually used to create crazy quilts. Crazy quilting has been experiencing a new appreciation and resurgence in recent years and although still having the same characteristics as the historical quilts have evolved due to newly developed and more readily available materials, products and techniques. Anything goes, from solid fabrics to patterned fabrics, basic stitching to more elaborate creations with lots of embellishing. Options for embellishing are almost unlimited. It is perfectly acceptable to embellish such things as jewelry pieces, ribbon embroidery, buttons, sequins, beads, keys, ciggies or other images on cloth, doilies, laces, fancy fibers and charms for instance. 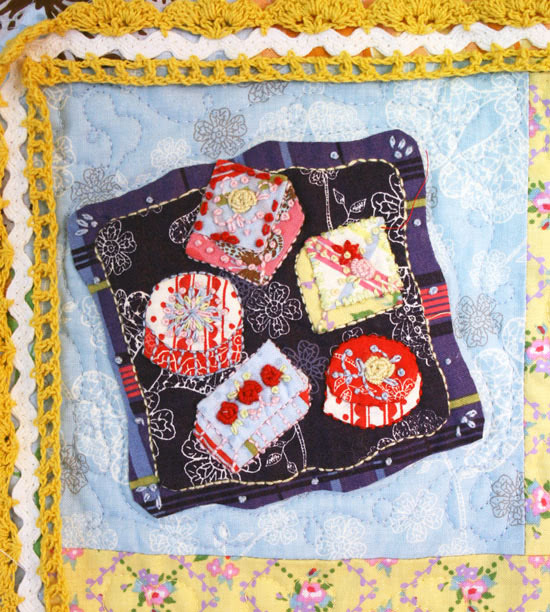 Two techniques used to construct crazy quilts are (1) paper piecing or (2) flip and sew (at times may be referred to as stitch and turn, stitch and flip, flip and stitch, or fold and sew among others). The pieces are constructed onto a base fabric such as muslin. Crazy quilting has no hard and fast rules. It is a wonderful means of expression as an art form in itself. Animals, flowers, insects and/or birds seem to be the favorite subjects used to decorate crazy quilts. You will very often see spiders in their webs on crazy quilts which is a symbol of good luck. Crazy quilting is not just used for quilts, but many items are now made using a crazy quilt patterning and embellishing techniques. Visit Connie Eyberg at http://ceoriginals.blogspot.com/ and http://ceostudiosolutions.blogspot.com/. Interested in more? Mosaic Magpie has a lovely write up with more photos of the full quilt at the beginning of this article! Do you personally challenge yourself to learn something new in quilting every so often? I do! This year I’ve become interested in not only learning more about embroidery but also taking a dip into the world of Sashiko quilting. I don’t know much about this.. but I have friends that do! Today I’m going to give you a little overview, some links to videos and articles.. then later this year we’ll dive a little deeper with an expert. Wikipedia says “Sashiko (literally “little stabs”) is a form of decorative reinforcement stitching (or functional embroidery) from Japan. 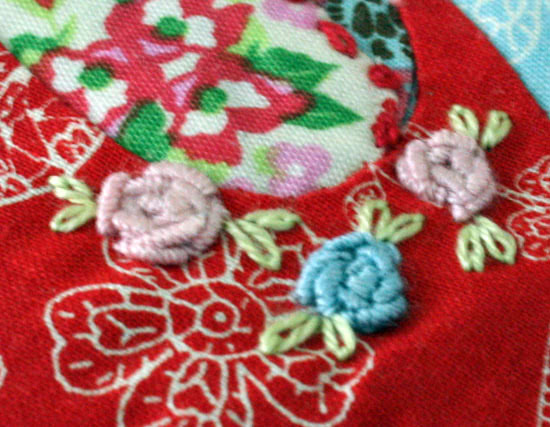 Traditionally used to reinforce points of wear, or to repair worn places or tears with patches, this running stitch technique is often used for purely decorative purposes in quilting and embroidery. 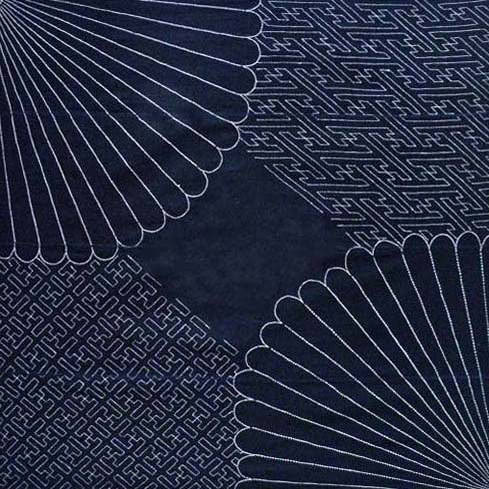 The white cotton thread on the traditional indigo blue cloth gives Sashiko its distinctive appearance, though decorative items sometimes use red thread. 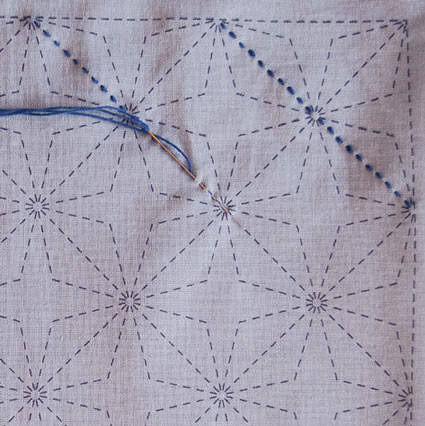 Sashiko is an embroidery pattern you put on the top of the fabric, just like the crazy quilting and regular embroidery. I’m drawn to the traditional navy with cream thread, it’s so beautiful! I can’t wait to try this! If you can’t wait and want to try Sashiko now.. there is a nice tutorial at Purlbee. Here is more info at About.com with some freebies to download. Did you know there is now a Sashiko machine by Baby Lock? I found this fascinating and will be taking a look at one next time I can! 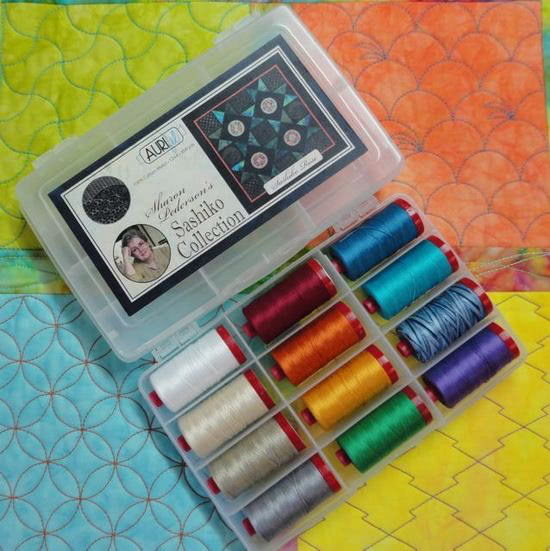 Our friends at Aurifil are sponsoring a thread giveaway to celebrate MY interest in Sashiko! This beautiful box of colors was selected by quilter Sharon Pederson. You can learn about the threads from Sharon at these videos: Video 1 and Video 2. What kind of thread to use for embroidery? There are so many choices! What type of embroidery is your favorite? What is your preferred size and brand of needles to use for embroidery? One winner will be randomly selected next Wednesday, April 25, 2012. One entry per person please. Pat Sloan is owner and founder of the quilting design and publishing company Pat Sloan & Co. She has published over 25 books, more than 100 patterns, nearly 10 fabric lines, and has had her work featured in all the major Quilt magazines. In January 2010, Pat started hosting her weekly Internet Radio show called Creative Talk Radio. 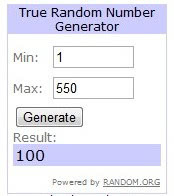 Congratulations to the winner #100 Winona.. check your email for a message from me. I usually use DMC embroidery cotton, and I try my hand at all types of embroidery. Now you might find this strange but I prefer to use a needle with a rounded eye as I find them so much easier to thread. great post on embroidery Pat – I generally use DMC in stranded cotton or perle 8 however I do have some beautiful australian threads in my collection from gumnut yarns and colour streams as well. I like doing stitcheries and I use a crewel needle in sizes 7 to 10, usually made by piecemakers or richard hemming & son. I usuallly use DMC cotton pearl threads. Love the antique look to embroidery blocks in quilts. My grandmother taught me her techniques and tips, sure wish she were hear to see some of my finished projects. I always use Anchor thread or DMC, they are the only brands available here, and I use them for x-stitch and free style. The needle I’m not picky… I use the first that comes around. I have always used floss or pearl cotton, I am goin to see if I can find someone close that sells this thread so I can try it on my handwork. I usually use DMC BUT lately have been trying out Aurifil. I would love to try some beautiful thread. I’m new to machine embrodery — so I have only used “regular” thread. It has been many years since I did hand embrodery, and it was just simple stitches. I saw a Sashik machine on Craigs list, but I was too slow to get it – took me a bit to justify wanting it!! I have heard such wonderful things about aurifil but must confess that I’m just learning about thread as I never realized that there were so many to choose from as well as so many types! I have only done hand embroidery and only use DMC….it’s what I knew…I have recently purchased a new Bernina and it has embrodiery stitches on it and so will need to figure out what thread is best to use…..I’m learning! I usually use dmc or 12 wt sulky for embroidery. DMC is usually the easiest to find and I have used over the years. I will start looking for a place that sells Aurifil, but right now I am interested in machine embroidery. I love huck embroidery (aka- swedish weaving, huck weaving, and a dozen other names)! It’s gorgeous and works up quickly so it’s great for last minute gifts that look really impressive. I generally work on the small scale (though people use this method on monk’s cloth to make afghans) so I use DMC 6-strand or Perle #5 depending on the application and colors I want. Thank you for a great giveaway. What a great give-away! I love using Aurifil thread and would like very much to win this. Thanks for the chance. I use DMC thread for embroidery. I LOVE Aurifil thread and use it all of the time for piecing, it’s awesome! I usually use DMC thread for embroidery. Aurifil thread is so awesome and I love working with it for applique and piecing. Thanks for the chance to win the Sashiko collection! I love Aurifil!!! I go out of my to find it. Best thread ever!!! Ooh what a great blog. Please include me in your giveaway. Thanks for the giveaway – I’d love to try some Aurifil thread. I like using size 8 perle cotton for embroidery, and size 7 needles by Scarlet Today. I love piecing with aurifil, have not tried it for embroidery. I have not done much embroidery myself. However I do remember that my grandmother always had embroidered pillow cases. Beautiful work. Thanks for offering the give away! I love simple redwork. Just seeing it, or working with it instantly brings me back to memories of my Great Gram! That and the smell of burnt toast! (She had a junky toaster)..lol! I usually use DMC or Cosmo floss for embroidery and cross stitch. Just starting learning embroidery and I use DMC! I have only been doing hand embroidery for a short time and I use DMC floss. Thanks for the chance to win. I use the DMC floss as well, I just started quilting and embroidery, I am totally in love with Crazy Quilting. I love this site, thanks for the chance to win. You are awesome!!! Quilting is Awesome!!! I like to use cotton perle thread mainly! I like crewel embroidery. Living in an old house it just seems to fit. When I visit museums I am always drawn to the needlework of years ago. I use crewel yarns to do the embroidery work. However, like all needleworkers, I want to try it all. 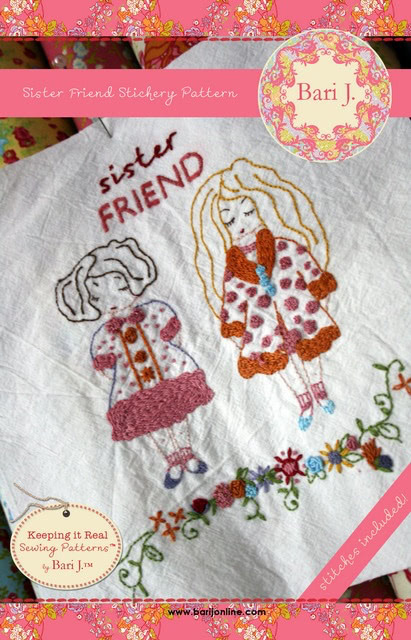 I was started on embroidering tea towels by my mother when I was 5. 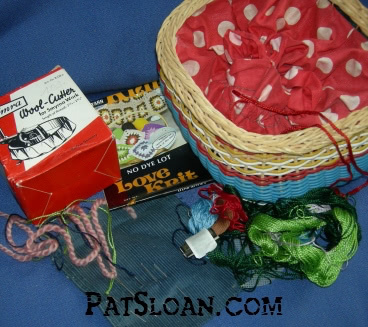 It’s been a lifetime of needles, fabric, threads and yarn, and new things to learn. the other is the Robinson Anton is the thread I use. I like to use Valdani pearl cotton size 12 or wool threads. I love Aurafil for wool appliqué and cotton appliqué…such a beautiful subtle shine. I use Valdani 12 to embroider on wool. Would love to try Aurifil. I do use 50 wt Aurifil to piece and ocassionally for quilting. Okay, I’m going to start out by being honest I REALLY REALLY WANT TO WIN THE AURIFIL. IT’S MY FAVORITE THREAD. But I’ve never used it for embroidery. I like the old time DMC that my Grandma taught me to embroider with 50 yrs ago. Aurifil 12 wt in every amazing color I can get my hands on! If I am hand embroidering–I use DMC & I try all types of embroidery. I use a needle that is dull on the point. If am machine embroidering–I use Aurfill. Janome, Marathon Sulky & any other thread that might give me the texture I am looking for. I use a red or blus tip needle. I would love to try the aurifil thread I’ve always use the DMC to embiordery with. I use DMC because it is widely available. I love to use this stranded cotton for making cording, bracelets etc using a marudai style cardboard base. Because the embroidery floss is not plied, the strands have more sheen. I love aurifil thread so I expect to love the heavier weight for embroidery. Crewel embroidery is my favorite. I have never tried Aurifil thread. My grandmother started me hand embroidering when I was quite young. I think DMC is what I have used recently. I can’t find my bad of floss right now to confirm that. I am currently playing with crazy quilting – it’s less intimidating for me, because if the stitches aren’t perfect, it’s ok, because it’s a crazy quilt. 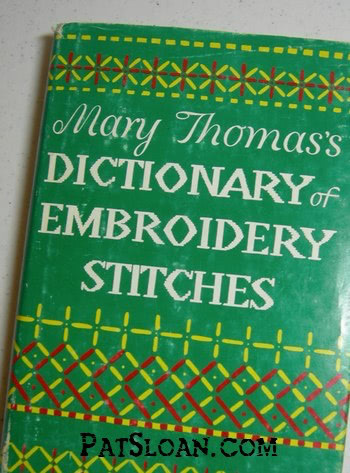 Grandma taught me a few stitches when I was a girl – and I think it was DMC. I’d like to pass on an bit of embroidery info to my granddaughter. It would be great to have wonderful thread to start her off right! I used to cross stitch a lot and then moved away from that kind of handwork when I discovered quilting. With small kids at the time, I avoided any handwork on quilts, thinking I’d never have time to get it done. Well, I took a small class on Hawaiian applique and I was hooked! All this to say, that when I cross-stitched I used DMC and being fairly new to the scene when it comes to embroidery, I’m overwhelmed by the choices! I do like 6-strand floss — you can get just the right amount of thickness to your stitches. And I recently ordered some Roxanne needles and really like them. I think, like with most anything, you get what you pay for. For all the time and effort put into quilts, it’s worth the money to buy quality tools and materials so the piece will last. Aurifil is my favorite thread by far…. I am not a machine embroidery person but I lover piecing with audifil.